injecting humanity (high touch) into the encounter between you and your customer. Furthermore, I say that it is not expensive to evoke delight in your customers. Allow me to share with you how giffgaff has generated delight and cultivated gratitude/loyalty with me and my daughter. Talking with my 11 year old daughter I found that her phone was useless as a phone as she had lost the SIM. It turned out that the SIM had gone missing several weeks ago. She hadn’t told me because she was thinking that it will cost money to get a replacement SIM and she didn’t have the money; she is great at spending, not so great at saving. Within a minute or so we had logged on her account. Straight away we found the link for ‘Lost SIM’ and then from there it took us less than 30 seconds to block the SIM and order a replacement. My daughter and I were both happy at how it easy it was. The job that we needed to get done (block the old SIM, order a replacement SIM) was done with several clicks and in less than two minutes. Easy, easy, easy! 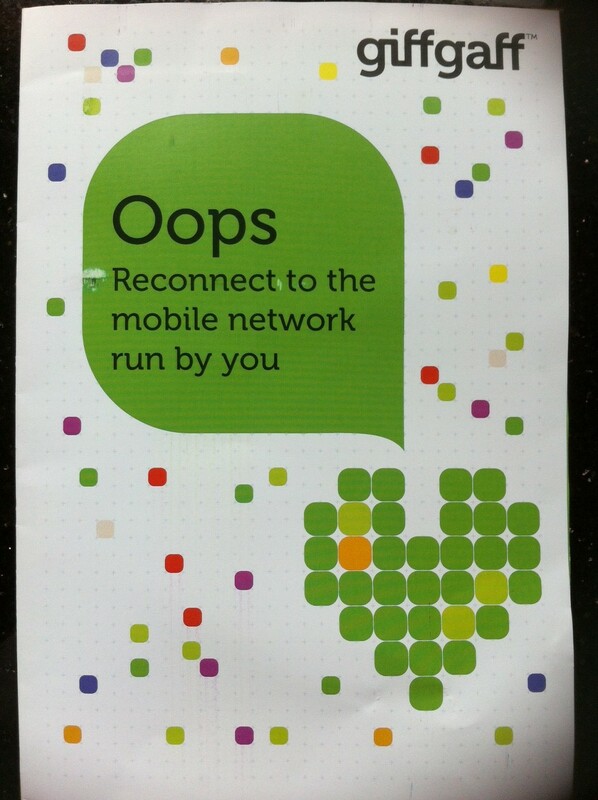 Thank you giffgaff for being there for us and making it easy to get the job that needed to be done, done. What else did we notice? We noticed that we were both grateful to giffgaff. Why? Because we were expecting giffgaff to charge us for this service yet giffgaff did not charge us. So giffgaff showed up as generous: a friend helping us out in time of need as opposed to a business intent solely on making money from its customers. Notice the language that is being used? How does it show up in your world? In our world it showed up as quirky/friendly/even fun. More importantly, it showed up as the kind of tone/language that a friend, a warm human being, would use as opposed to a corporation. What was our experience? Surprise and delight. What generated this surprise and delight? The ‘tone’ that is conveyed by the language that is used. This ‘piece of communication’ showed up as being written by a caring human being, a friend! This is personalisation that actually shows up as personal and pulls the heart strings. It occurs as genuine, heartfelt, authentic. There is so much talk about ‘social’ and so little understanding of ‘social’. I say this piece of communication is ‘social’. I say if you really want to get social then study this communication. 1) Ease matters, it makes a difference. Lack of ease drives up customer frustration, generates customer complaints, drives up costs as customers use the call centre as opposed to using the website. And lack of ease drives up defection: customers go to suppliers who are easier to do business with. There are companies that have become giants simply because they have got ease right: Amazon is the giant that it is because the folks at Amazon have made it so easy to buy all kinds of products from Amazon. 2) Speed of response matters. The faster that you are at responding to customer requests the more of an impact you make. Customers are human beings, human beings impute – they read stuff into stuff. When you respond fast customers impute that you care, that you are competent, that the customer is in safe hands. When you slow in responding customers assume that you do not care about them and that you are incompetent, understaffed, unprofessional…. 3) Generosity matters, it is noticed, it touches the heart. Generosity does not have a big presence in the business world. As customers we expect to be made to pay for just about everything. We particularly expect to be squeezed for every penny, every dime, when we have an urgent need and we are at fault. In such a world generosity gets noticed. And for many of us generosity generates gratitude. Most of us are brought up to practice the rule of reciprocity: one good turn deserves another. 4) You can generate delight and affinity simply by using the right language with the customer. What does it require? Humanity: getting and treating human beings with dignity, with compassion. And it is cheap! 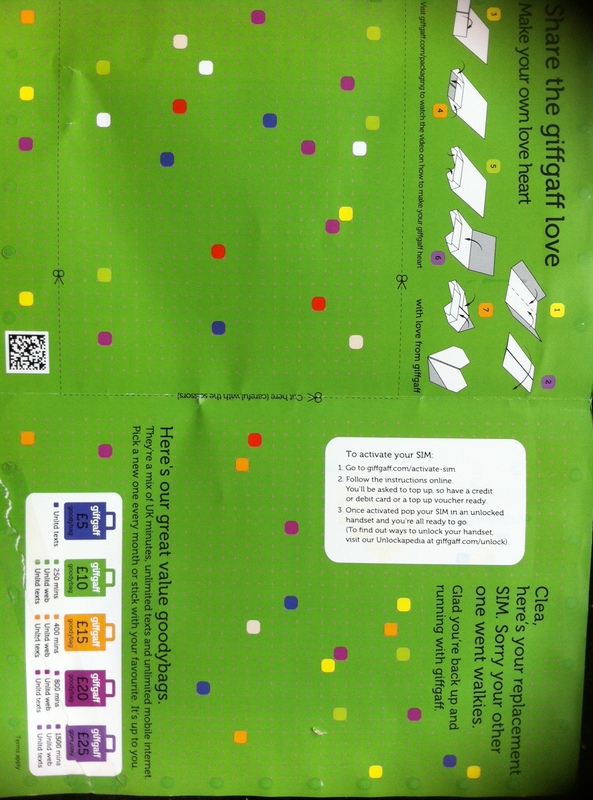 How much money would giffgaff have saved by making their envelope bland (not colorful) or using cold, unfriendly, corporate speak? Sometimes I think that for all the talk about customers and customer focus, what is really missing is ‘love for the customer’ as a fellow human being. Put differently, what is missing is putting our humanity, the best of our humanity, into the game of business. I have been using the giffgaff network for over 2 years now and I can honestly say it is the best decision I have ever made! Great Call Rates 10p Per Minute, 6p texts and FREE calls and texts to other giffgaff members! Plus if you order your SIM card from another member you get an extra £5 Credit with your First Top-up. You could be right: it is so difficult to tell great marketing apart from authentic caring/contribution. Each time this comes up I think about the Dove Real Beauty marketing stunt. Your post points to one things that many leaders know and do and that is the pursuit of ease and simplicity. Previous Previous post: What does it take to make an impact as the Chief Experience Officer?